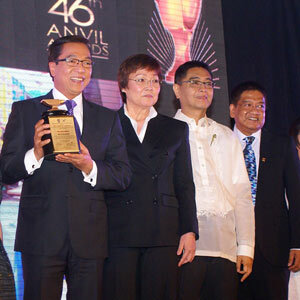 Ted Failon (leftmost) and Tina Monzon-Palma (second from left) accepted ABS-CBN’s trophies during the 45th Anvil Awards. "ABS-CBN Corporation bagged five awards for its outstanding PR campaigns, including the Bronze Anvil award for its Guinness World Record-breaking fun run "10.10.10. Run for Pasig River" at the 45th Anvil Awards, considered as the Oscars of the local PR profession. "ABS-CBN also won Awards of Excellence for "Boto Mo, iPatrol Mo," "DZMM Kapamilya ShowerNa," "Sagip Kapamilya," and again, the "10.10.10. Run for Pasig River" which are public service-skewed campaigns that encourage Filipinos to be proactive members of the society in relation to his environment, country, and fellowmen. "ABS-CBN Foundation Inc’s "10.10.10: Run for Pasig River" showed the world how Filipinos ran united towards a good cause, which is to help rehabilitate the historic Pasig River. About 116,086 Filipinos responded to ABS-CBN’s advocacy, woke up early in the morning, and flocked the MOA grounds to beat the world record on the largest footrace in terms of number of participants. "The large-scale project also generated large-scale results as more funds for the Pasig-rehabilitation project "Kapit Bisig Para Sa Ilog Pasig" were earned and more importantly, the public became further aware and even involved on the Pasig cause. "Multiplatform election campaign "Boto Mo, i-Patrol Mo," on the other hand, encouraged more vigilant and more active Pinoys as it successfully triggered a spike in voter registration and created wider awareness on election issues and candidates through its activities such as monthly nationwide BMPM days, citizen journalism workshops, leadership fora and debates, election specials and a concert. "Through BMPM, ABS-CBN broke the news on the Maguindanao massacre, considered as the deadliest act against journalists in the world, when a Boto Patroller first sent the network a picture from the crime scene. "Meanwhile, "DZMM Kapamilya Shower Na" and "Sagip Kapamilya" served as a light to Filipinos amidst the darkness brought about by Typhoon Ondoy. "DZMM Kapamilya Shower Na" is a noble and novel way of helping thousands of Filipinos of who lost their homes. A 20-foot container van was turned into into a mobile shower facility that benefitted thousands of typhoon Ondoy victims cramped in evacuation centers or unhygienic toilet facilities. The mobile shower van has 12 fully tiled cubicles with shower heads and mirrors. It was deployed to areas struck by calamities to help victims. "ABS-CBN’s "Sagip Kapamilya," on the other hand, mobilized all its resources to bring forth the much needed relief of Ondoy victims in the form of food and non-food items to the families affected. ABS-CBN executives, stars, employees and even ordinary citizens were able to show their compassion to those in need by serving as Sagip Kapamilya volunteers who accepted donations via telethon and gave away goods via relief operations. "The Anvil Awards is an annual event organized by the PRSP that honors outstanding public relations programs and tools. Prior to the Anvil Awards, ABS-CBN earned recognition for its PR programs from the Philippine Quill Awards given by the International Association of Business Communicators."